Paleogene fossils of the Ciconiidae are only known from the Old World, where also most extant species occur. The putative ciconiid Eociconia sangequanensis Hou, 1989 from the middle Eocene of China is based on a fragmentary distal tarsometa-tarsus (Hou 1989, 2003). Although the specimen is of size and proportions similar to those of the tarsometatarsus of the extant Ciconia, its unambiguous identification requires additional fossils. The earliest well-represented stork is thus Palaeoephippiorhynchus dietrichi from the early Oligocene of the Jebel Qatrani Formation of the Fayum in Egypt. This species was described by Lambrecht (1930) on the basis of a partial, three-dimensionally preserved skull, and was about the size of the extant Saddlebill (Ephippiorhynchus senegalensis). As in the extant taxa Ephippiorhynchus and Jabiru the tip of the beak is slightly upturned. Rasmussen et al. (1987) tentatively referred a distal tibiotarsus from the early Oligocene of the Jebel Qatrani Formation to P. dietrichi. 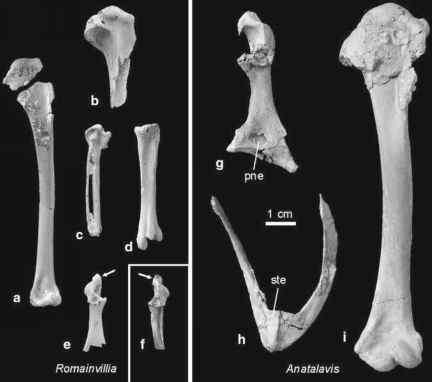 Another distal tibiotarsus of a stork was reported from late Eocene deposits of this locality by Miller et al. (1997), who refrained from assigning it to P. dietrichi because of slight differences from the early Oligocene tibiotarsus. Boles (2005b) described Ciconia louisebolesae from the late Oligocene/early Miocene of the Riversleigh Formation in Australia. The fossil material of this species, which was about the size of the extant White Stork (C. ciconia), consists of a partial skull and incomplete limb bones. The taxon Ciconia was also described from the Neogene of Australia, and it is unknown why it became extinct on the continent, where the only extant ciconiiform species belongs to Ephippiorhynchus (Boles 2005b).